There is a cairn on the summit. Cornasaus is also the name of a townland in Meath. Has been called Monercrom. 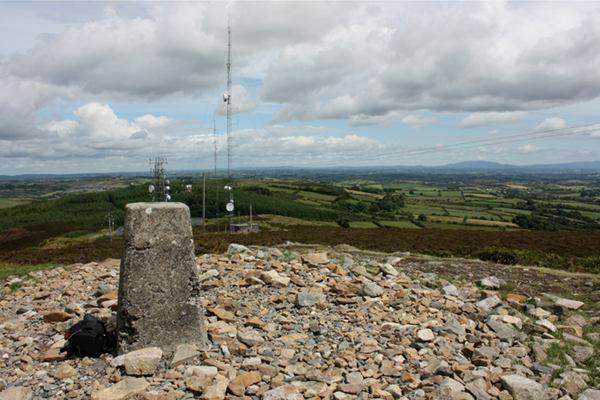 Cornasaus is the highest hill in the North Midlands area and the 1072th highest in Ireland. 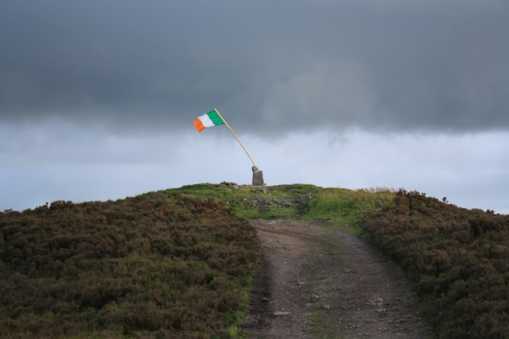 This hill is known as nothing else other than Lough an Leagh by all locals (which is what appears on all sign posts, information boards, literature and websites). 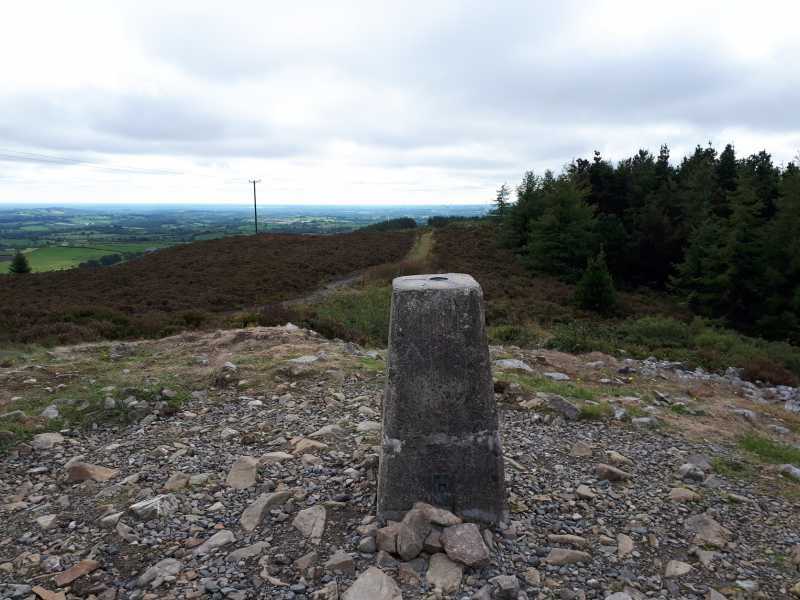 It is said that on a clear day you can see 13 counties from the summit. On the clear evening that I ticked this off my local 100, I definitely counted 9. You can see the Cooley Mountains, with the Mournes poking out behind them, with Gullion and the nearby plains of Monaghan, over to Cuilcagh. I think that some of the hills of Leitrim and Westmeath might have been in view, but I could definitely see Loughcrew and on to the Dublin and Wicklow hills! Impressive enough for a small hill. My initial plan was to park up in the village of Tievewurker and walk out “from the front of the mountain”. There is a lane at N 70613 92763 B which is shown on the OSI map. As I approached the gate I met the resident of the house alongside, so I checked was it ok to walk the lane and was denied access! I later found out, that this lady owns no land on the lane, that there is a right of way and she had no right to stop me. I fully intend to return at some point to walk my originally intended route and hope that I meet her so I can give her a wave as I climb over the gate to the lane! A bit annoyed by this unnecessary inhospitability, I got in the car and headed for the site of the fair at Muff, before driving on up to the picnic area mentioned by Wicklore. A local I met there informed me that Mass is still celebrated here at the stone, at dawn on Easter morning. I initially headed North, away from the main summit, turning right at the RSJ barrier and down the lane to point N 73383 96155 C, I figured I had descended enough and turned back to ascend the hill on this pleasant wee lane. On my return to the barrier I crossed it and started to explore the hill on the Northern end of the ridge, that is actually marked as Cornasaus on the map. This conifer ridden hill and its ruined cairn are quite unimpressive and my advice would be to not bother with it! Getting back to the car, I took a slightly different approach to the summit, walking west along the road a short distance to a sign for Adrian’s way, this is a more aesthetically pleasing track than the access road to mast, you can follow it to the edge of the forest and turn 90 degrees left to take the short steep, rough track to the summit. This part of the hill is worth a wander though, I headed over to the road on the far side at N71750 94881 D, which is an alternative place to park up. There is another cairn at N 71922 95410 E which is also worth a look. 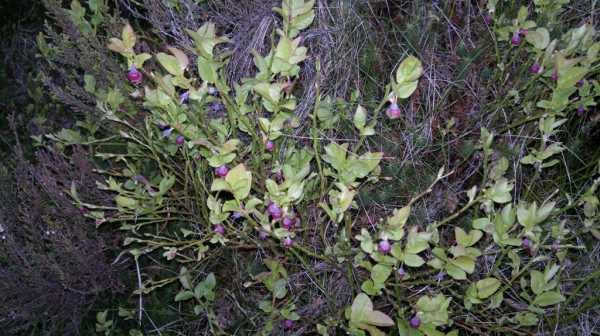 On this early May evening I did discover Bilberry bushes, only on the southern side of the hill though. 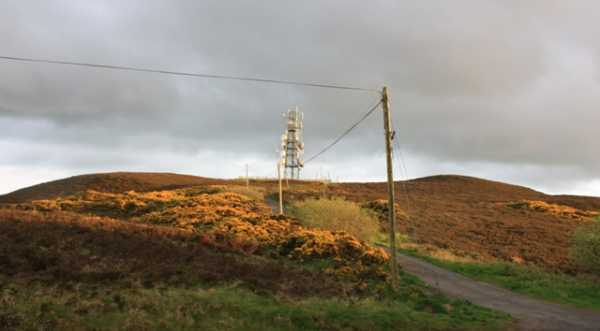 Overall a grand wee hill that I will walk again on midweek summer evenings! Picture from TommyV : Cornassaus trig point. Cornassaus or Lough an Leagh? Picture from csd : The view north from the summit of of Cornasaus. Picture: The view north from the summit of of Cornasaus. I parked in the same spot as wicklore and headed up the track, passing quite a few people out picking bilberries. It's less than 500 metres from the parking spot up to the summit, so this isn't going to tax anyone. If fact, you could drive almost all the way to the top if you weren't too worried about grounding your sump. 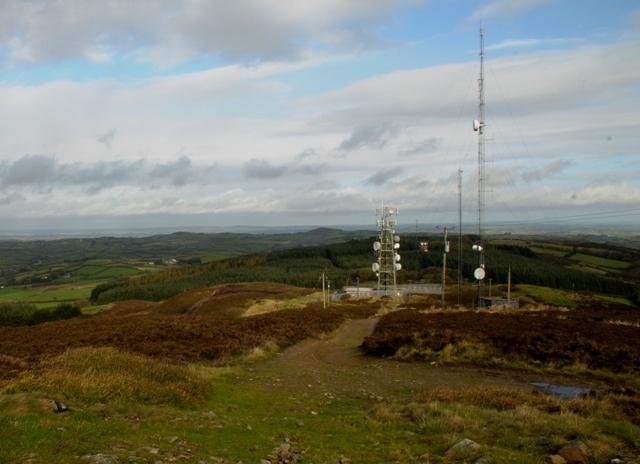 Plenty of telecoms installations near the summit, with the largest one belonging to RTÉ.